The picture above comes from the movie called Kalpana, made in 1948. This is not to be confused with another movie Kalpana, made in 1960, although they have one thing in common, which is that my favorite actress-dancer was in both of them. The Kalpana made in 1948 was actually the first movie that Padmini ever was in. But it took me a long time to ascertain that this came out in 1948, and I still can’t be absolutely sure, because the date seems to vary from article to article, site to site, ranging from 1944 to 1950 (or actually 1952, but only one site claimed that year). This, though, is the conclusion I was able to reach in the end: Kalpana, as one or two sites said, took five years to make. Padmini performed for this movie in 1944, when she was only 12 years old. The movie didn’t come out until 1948, and probably a lot of people didn’t see it until 1949 or 1950. 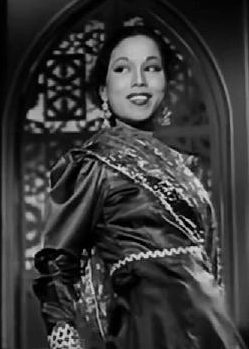 Following its release, Padmini started appearing in a few other films, so she started acting and dancing in films for real in 1949. The creative dance movement in India owes its growth to Uday Shankar. 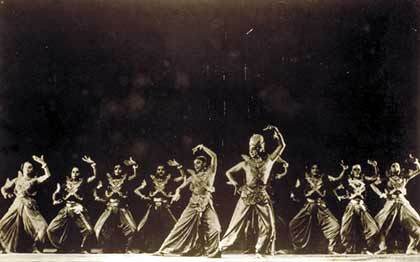 With his success in earning great respect for Indian dance in the 1930s, a unique movement of revival of classical dances had begun. Though he had no formal training in any classical form, his dance was creative. He used the essence of various traditions and techniques in his dance dramas and succeeded in presenting an integrated composition. His exclusive use of only Indian musical instruments is a remarkable feature…. His superb showmanship and perfection cast a spell on his audience, all over the world. This dance, by the way – and this clip in particular – reminds me a little of some clips from Shobana on Broadway. But that’s not surprising. I read somewhere that there simply are no prints of Shankar’s Kalpana available commercially. That’s really too bad. But maybe there will be sometime. If anybody knows of some way to get a whole copy of that movie – or even just a clip from it – I’d love to hear about it. A print of Kalpana is there with the West Bengal Film Archive. And they screen that frim time to time, mostly at Nandan, the West Bengal Film Centre. However, I always missed any such show, and I am yet to watch this extravaganza too. I have seen this film possibly in 1953. Its a classic on Indian Dance and with Uday Shanker his wife Amala Shanker was the leading female character in this film not Padmini. For the last 25 years I have been trying to get tape or cd of this film in various cities that I happened to visit viz, Mumbai, Delhi, Chennai, Bangalore, Kolkata, Hyderabad but could not succeed. If West Bengal Film Archives has it, it should come out with its prints on cds and make it commercially available as such classic may never be made in another 100 years for Uday Shanker’s are not born again n again. I request that whosoever happens to see my comment and is in a position to move West Bengal Govt, should definitely try to get this suggestion through. Hi, there. Thank you for this interesting information on Uday Shankar’s Kalpana. It’s great that you saw this. I know that Padmini was not the lead in this movie, but my point was that it was the first movie in which she appeared. Many sources acknowledge this; the problem is that many get the date wrong. Because I am a big Padmini fan, I did a lot of Internet searching, and I was finally able to conclude that the correct original release date for Kalpana was 1948. It is annoying that many sources say that Padmini made her debut in Kalpana in 1950, because I know that there were quite a few films she was in before 1950; I’ve seen some clips from 1949 and have seen many listed on different sites. From the research I did, I have found that the first film in which Padmini was the leading female was Manamagal, released in 1951. I posted a clip from that movie, but it was taken down. I indeed have copy of the film in VHS. So far my knowledge goes there are several prints of this available in India and elsewhere. While searching for the film Kalpana, I came across your site. I saw the film in Kodaikanal way back in 1978. The film so impresed me that the scenes still haunt me with a sense of nostalgia. Uday Shankar and Amala Shankar made a great pair. Uday flows from one dance form to the other so naturally. The film included some great dancing traditons. I too am in search of a CD or DVD of this black and white milestone of Indian Cenema. By the way, Robert, you have introduced me to an interesting Web site. Apparently, you are dedicated to some important environmental causes. Keep up the good work! I have read your comment, i would be lucky if you would see this comment and respond back…. Is there a way i can contact you, via mail, call…. i am study dance, and have been working closely with this one, i would really like to interact with you regarding the copy of VHS you have, i am really looking to watch the movie and there is a team of artists who are also willing to watch. It will be very very helpful, pleaase let me know! Reading the comments here , I realize how lucky we have been , seeing the film KALPANA time and again, through our formative years and also later. I am surprised to find one of our videos on youtube! I have been a student , and then a teacher and a senior member of the Uday Shankar India Culture Centre for many years now. This dance is named “Snanam”, and is re-created/re-choreographed by Smt AMala SHankar, Date Yday Shankar’s wife and our beloved and esteemed teacher. I am overjoyed to see this interest in KALPANA, a movie of great importance, not only for people interested in Uday Shankar’s form of dance, but also as one of the most important documentation of a form of dance which made Indian dance and Shri Uday Shankar well known all over the world from the late 1930s till the 60s. Uday Shankar India Culture Centre is still a Dance Institution in Kolkata, with Smt Amala Shankar at its helm, and there is a UDAY SHANKAR DANCE FESTIVAL every year in Kolkata starting from the 7th/8th December which , among many other performances and activities, also makes it a point to have the screening of KALPANA. There is a huge community of dancers/ ex-students who still remain attached to the institution, and to Smt Amala Shankar. KALPANA Is not available on DVD or CD. Its sad that one can buy all the latest trash hindi movies at any shop, but is unable to see this wonderful film in any form. The group dance photograph of Kalpana (1948), has my mother (Yogam) , 2nd person from left. she is no more. i would be happy if someone can organise or let me know where i can get a copy of this movie. Urmimala, thank you for your good words about this post. It is nice that I am continuing to see such enthusiastic responses to this post fourteen months after I wrote it. Although, this has little to do with me and much to do with the genius of Uday Shankar. I would love to be able to go to that dance festivval one day! And it is sad that Kalpana (1948) is not available anywhere. I live in the U.S., so I can’t say that you can buy all that latest trash movies at any shop, but since I live in Jackson Heights, I am near a bunch of stores where you can buy latest trash Hindi movies as well as older ones, and it is sad that Kalpana is nowhere to be found. Venkat Iyer, very interesting to see that your mother was in this film and is in this photo! Sorry to hear that she is no more. We’d all love to know where we could get a copy of this movie :) , but I can see how it has special significance for you. I have seen Kalpana in the 1980s while being a member of a Film Club where we saw all kinds of International and Indian classics. Uday Shankar was mesmerizing in his dances, simply amazing ! 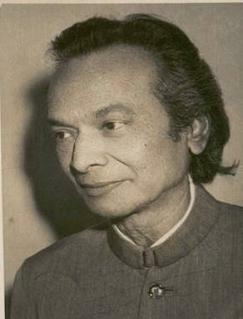 The music of Kalpana was also rather noteworthy for TimirBaran and his Orchestra. TimirBaran was one of the oldest disciples of Baba Alauddin Khan who was the guru of the great Sitar player Pandit Ravi Shankar and greatest Sarod Player Ustad Ali Akbar Khan. Since then I am searching for either a print of the movie or a clip on Youtube without success. I was also searching Uday Shankar’s whereabouts in youtube. A short video has been uploaded by Sobers Chatterjee, an Indian Classical and Flamenco-Jazz musician (a student of Pt Jayanta Bose). Sobers is quite frequent in Kolkata, next time when I meet him I will ask if he knows about Kalpana. Anirban, you are welcome, and thank you for letting me know about that YouTube clip with a rare glimpse of Uday Shankar dancing back in 1932! That is great… I have “favorited” it, and I’m going to put it up on this blog soon. Respected Richard, I too am interested in collecting the old classics. I really appreciate your effort in tracking them. Were you able to get a copy of “KALPANA”? Was Mr Biren able to atleast, digitise his VHS of KALPANA? Your response is highly appreciated. I want to buy old movies from 1930 to 1970…. Udaya Shankar’s Kalpana was played in Kanoor once in early 1980’s .One of my friends hadd seen that.She had shared me s sceen in which Lalitha and Padmini are been introduced in the movie. Richard,its for you.I have read that Ragini first apperd b4 sceen in a Kannada Movie(dance sceen).can u pls chase the film? I can’t help you with a VHS/VCD/DVD copy of this film, but tell you that a good quality print certainly exists. I have seen the film in late 1990s on Franco-German channel ARTE (http://www.arte.tv) – in very good quality. It was an evening programme dedicated to Indian Dance. It featured among others the famous, recently deceased, Pina Bausch (http://www.pina-bausch.de/pina_bausch/index.php) interacting with Indian artists. By the way, I also found a 1997 article written by someone named Joan Erdman, who said that she’d just “recently” seen this film in Madras. So, maybe it was more available at that time. And I just saw another site with a URL that includes the phrase “desifun,” which claimed to have the film for free viewing. But when you go to the site, it says something like “Sorry, this film is no longer here.” “Fun,” indeed – as in a trick being played on us. This is the first time I’m reading this blog, hence my comment comes this late – I watched this film in April 2011 at NFAI, Pune. It was part of a dance festival organised by Hrishikesh Dance Academy here. The print was as good as you can expect a 1948 film to be, and the experience was mind-boggling. While one could see how a film dealing with such abstract content would not have worked for the ’40s movie audience, it gives the present generation a rare peek into a very interesting year in Indian history. The film seems to be set in the brief period of time between the day India became independent, and the assassination of Gandhi – for he is referred with due reverence and as a living legend. Just one of the many little things that makes the film important to watch. Welcome to my blog, Deepti! And thanks for the comments on your viewing of Kaplana – now I want to see it even more. Regarding the interesting historical moment… That reminds me of a few similar in-between moments in the 1947 Tamil film Nam Iravu, which is obviously a celebration of upcoming Indian independence that was filmed before Partition. There’s more discussion about that in a post that I did and, especially, the following comments, in July 2010 . I came across this blog just recently. I have seen the clips of this film Kalpana, at Nehru Centre in UK a few years ago. Infact Smt Amla Shankar was visiting then and she gave a few dance demonstrations from the film and gave a talk on her exoerience while working in the film with Uday Shankar. It was completely out of this world. I was lucky to spend some time with her while she was in London. The film speaks volumes about the dance and music, which still haunt me with a sense of nostalgia. Hi Biren, I read your comment which says you have a VHS copy of this masterpiece. Please let me know if I can get the same from you . I really need this copy. Thanks. Recently I read Mohan Khokar’s book “His Dance, His Life A portrait of Uday Shankar”. The book says that the film opened simultaneously in five theaters in Bombay and seventeen others in the country. When it reek Ed an award in Brussels in 1949, copies were acquired by thirty two countries for their archives. So, I think that it should be possible to find a good copy somewhere. On the other hand, from the article “honoring Uday Shankar” by F. Hall the film is interesting but disappointing except for two dances. Kalpana was released in five Bombay theaters on February 13th 1948. Apparently it was not successful at the box-office despite very good reviews. Uday started shooting Kalpana as early as the first quarter of 1945. 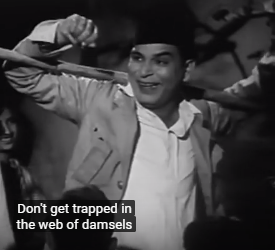 I was looking at Aurat (1940) tonight and to my great surprise, if I’m not mistaken, Uday Shankar and Amala are dancing in it (just after the Holi dance, 43mn from the film start). So Kalpana is not Uday Shankar’s only movie. Regarding the 1940 Aurat, I didn’t know that. I’ve seen copies of the Shemaroo Vintage issue of it, with English subtitles and everything, in the New York Public Library. I’ve had other priorities on my list, but maybe I’ll get it soon and take a look. The NFAI has a restored copy, Richard. And it really is as good as the copy restored by the Bologna archives and the Scorsese foundation ( they did a 2k restoration in 2012), suprisingly enough. There is also a copy of the Mohan Khokar book at the archives. I had seen a version of this film at this site before, but it was almost difficult to look at and it lacked subtitles. I’ve just looked at this version for a few minutes and it is very good and it has subtitles.